Dr. Shanna Kennedy-Quigley’s paper from the Etruscan Studies Journal on the Etruscan visual representations of the Birth of Athena and Minerva provides historical, artistic, and cultural perspective of its common use in imagery, as adopted by not only The American Minervan, but many others. The paper explains the significant differences in the Etruscan cultural attitudes toward women, from those of their Greek contemporaries. It examines Etruscan representations of the myth, and its departure from Greek archetypes, demonstrating that these variations reflect the liberated status of women in Etruria. The study argues, that Etruscan deviations from the Greek representations was an artistic choice. Minerva (goddess of wisdom, strategic warfare, sponsor of arts, trade, and strategy), had become symbolic in early United States history, art & architecture, and a representation of the early republic and republicanism (see Columbia – American Minerva and the Fasces in “Reconstruction” for Equal Rights (1868), Harper’s Weekly). Minerva does not represent however, to the ancient philosophers and theosophists merely allegorical, characteristics, behaviors, or art, but the myth of her birth has reference to (1) cosmogony, and (2) thus represents an occult PRINCIPLE, among the “Gods” in nature; as INTELLIGENCE, or MIND — a “God,” as to the metaphysics of Force and Motion in Occult Philosophy; and as the source of the Initiate’s mind, their resurrection, or spiritual regeneration. I have tried to use the ideal as it was variously comprehended, and as a model for both sexes, for it appeals to the mind, or soul. The fact her characteristics and representations have some foundation in Etruscan women, makes it all the more real. Moreover, characteristics associated with Menvra, are republican, the democratic Ideal of MAN in-becoming a model educated (enlightened) citizen. Kennedy-Quigley, Shanna. “Etruscan Visual Representations of the Birth of Athena and Minerva: A Comparative Study.” Brewminate, Etruscan Studies, 12 May 2017, brewminate.com/etruscan-visual-representations-of-the-birth-of-athena-and-minerva-a-comparative-study/. Artist. Godfried Maes, Minerva representing Evropa, 17th c.
“The myth of Zeus’s miraculous propagation of Athena is the subject not only of such Greek poetic masters as Hesiod, Homer, Aeschylus, and Euripides, but a favorite as well among Archaic and Classical Greek artists, eventually coming to occupy the East Pediment of the Parthenon. Perhaps through the importation of such portable artworks as painted vases, the Etruscans were exposed to the legend, the fundamental iconography of which they assimilated and transformed. The purpose of this study is to demonstrate that Etruscan deviations from Greek archetypes for representing the birth of Athena exemplify Etruscan cultural attitudes toward women, which differ significantly from those of their Greek contemporaries. This study will examine Etruscan representations of the myth, noting Etruscan departures from Greek archetypes and demonstrating that these variations reflect the comparatively liberated status of women in Etruria. By considering the myth in terms of distinct cultural convictions regarding women, the implicit objective of this study is to dispel persistent philhellenic prejudices: Etruscan deviation from Greek originals does not devalue the Etruscan artistic tradition. Rather, as the result of artistic choice, Etruscan interpretations provide evidence of local mores and should therefore be recognized as indispensable tools for comprehending a largely enigmatic society. The balance of the literary references to the birth is concerned almost exclusively with the moment of Athena’s parturition. On the details of the occasion, they concur: clad in full war regalia and brandishing a weapon, Athena vaulted from her father’s brow. The Homeric Hymn 28 to Athena and Pindar’s Olympian Ode 7 record a remarkable reception to this unprecedented occurrence, as the attendant Olympians are rapt and the universe trembles with awe. Pindar, Euripides, and Apollodoros additionally attest to the facilitation of the birth by either Hephaistos or Prometheus: in each instance, it is said that one of these two figures cleaved Zeus’s skull with an axe, thereby releasing the goddess from the confines of her father’s cranial womb. Like the literary sources, Greek visual representations of the birth of Athena coincide most often in their portrayal of the delivery of the armor-clad goddess from the crown of Zeus’s head. In this way, Zeus and Athena are consistently assigned compositional primacy. Conversely, Metis is conspicuously absent from artistic renderings, evidently expunged from the visual tradition. Hephaistos is favored over Prometheus as assistant to the birth father in these scenes, despite the inclusion of both figures in the textual resources. Other attendant deities, including Poseidon, Ares, Hermes, Apollo, Hera, Demeter, and Artemis, as well as the goddesses commonly identified as Eileithyiae, do not appear to actively contribute to the delivery process; rather, they represent the “immortal onlookers” mentioned in the Homeric Hymn to Athena. Although the presence of these immortals lends an air of grandeur to the occasion, the principal reason for their presence seems to be compositional. They direct their attention, and hence that of the viewer, to the remarkable birth. The manner in which they are arranged bolsters the visual supremacy of Zeus and Athena. Ultimately, illustrations of the birth of Athena extol Zeus as Athena’s sole progenitor. 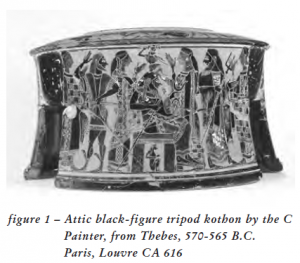 A black figure Attic tripod kothon by the C Painter dating to about 570 B.C., an early depiction of the legend, exemplifies the typical visual dominance of the Zeus-Athena configuration (Fig. 1). The enthroned king of the gods occupies the central position in the scene, identifiable by the lightening bolt he grasps in his left hand, as well as by the mythological context. The delivering father is remarkably composed: he effortlessly endures the delivery. Grave stelae belonging to women who died in childbirth, many of which depict the parturition process, demonstrate the striking disparity between the posture of a delivering mortal woman and that of Zeus. In contrast to the palpable exhaustion of laboring women and necessary support of midwives, Zeus is poised, apparently self-reliant, and occasionally even energetic. Regardless of the assembled deities, many of whom are qualified to aid in childbirth, Zeus delivers Athena with minimal assistance. Only Hephaistos’s violent yet effective intervention is permitted to facilitate Zeus’ endeavor. The tripod kothon shows Athena wearing a crested helmet and striding belligerently forward, spear held aloft, shield thrust defensively forward. The threatening manner in which she advances is arguably a reaction to the unusually brutal nature of her birth. Liberated from her father’s body by the presumably unexpected blow of Hephaistos’ axe, she springs forth, prepared to launch a counter attack. The lack of visible interaction between Athena and the attendant deities may, then, be justifiable: even as a newborn, she inspires trepidation rather than tenderness. In further agreement with certain written sources, illustrations of Athena’s birth regularly include Hephaistos, axe in hand. Having just cleaved Zeus’s skull, he invariably turns to depart, perhaps intimidated by the young warrior. Though Hephaistos, the infirm smith god, seems an unlikely candidate for what is essentially the role of midwife, his assumption of this position is significant. Having shed the traditionally requisite maternal contribution to proliferation, any concrete contribution to the delivery was necessarily male, in order to maintain the extraordinary nature of Athena’s birth. Furthermore, as the inferior result of Hera’s attempt to propagate independently, Hephaistos’s presence in both literary and visual accounts encourages critical assessment of the physically pathetic Hephaistos, spawned of Hera (the archetypal woman), as opposed to the mighty Athena, born of Zeus (the archetypal man). By this comparison, Zeus’s propagative capabilities are shown to be superior to those of his wife. Four female figures, generally identified as multiple incarnations of Eileithyia, a goddess of childbirth, fill the scene depicted on the tripod kothon. All four regard the central pair, each raising a hand in a deferential gesture that purposefully leads the viewer’s eye to Zeus and Athena. Similar figures appear in the majority of the visual representations of the birth, generally motioning toward father and daughter. That the goddesses pictured on the tripod kothon dare to touch the head of Zeus is uncommon: in most instances, they make no physical contact with the central figures. Their ineffectiveness as midwives, like that of Hera and Demeter, underscores the independent nature of Zeus’ propagation. The visual importance assigned to Zeus’s independent generation of Athena is particularly meaningful when considered in light of the Greek cultural attitude toward women. The primary function of women – at least respectable ones – in Greek society was the provision of sons, children who would inherit their parents’ citizen status and family property. The proliferation of the family, and hence the preservation of the polis itself, was dependent upon the production of male offspring, and a proper Athenian matron was essential to this endeavor. In his autonomous propagation of Athena, Zeus transcends a physical limit imposed upon mortal men, and appears to be celebrated for this triumph. While clearly derived from Greek archetypes, Etruscan versions of the birth of the warrior goddess deviate significantly from them. In accordance with the Greek paradigm, Etruscan interpretations, ranging from the mid fourth to the third century B.C., consistently feature an enthroned Zeus (Tinia) with Athena (Menrva) emerging from the crown of his head. Etruscan versions, however, alter the Greek visual hierarchy. Two or more specifically named native goddesses are incorporated into the scene, and these figures assume an integral function in the delivery process by acting as capable midwives, rather than passively witnessing or lauding the birth, as do Hera, Demeter, and the Eileithyiae of the Greek examples. Their interaction with the central pair diffuses the central focus which is characteristic of the Greek scenes, thereby encouraging the viewer’s attention to roam the scene and the viewer to acknowledge a vital female contribution, possibly even a surrogate maternal element, to the realization of Athena’s parturition. Perhaps the glory bestowed by the Greeks upon Zeus for his ability to bear Athena himself, with no need of a woman, was unbefitting to the Etruscans, who so valued the couple in art as in life. The Etruscans viewed their wives as individuals of essentially equal standing to men, certainly valued for their procreative ability, but also appreciated for the companionship and intellect they offered their husbands and other members of the community, both male and female. The oldest extant Etruscan interpretation of the myth of the birth of Athena is found on a 350-325 B.C. bronze mirror from Arezzo, and although the similarities between this representation and Greek examples are striking, the departures are remarkable as well (Fig. 2). A delivery scene involving five personages, each identified by an inscription, unfolds, but while the Etruscan equivalents to Zeus, Athena, and Hephaistos are easily recognizable, their characterizations have been notably altered. Furthermore, two specifically Etruscan female figures included in the scene are difficult to reconcile with the Greek model: their dynamism and intimate interaction with Tinia make them incomparable to any of those deities present in Greek renditions of the myth. At the center of the composition, Tinia is seated, his abdomen bared. He clutches a lightening bolt in his right hand, the sharp end of this spear-like object pointed downward, and in his left hand he grasps the top of an ordinary staff. His curly locks are in relative disarray, perhaps evoking the image of a woman who has endured hours of labor. In this Etruscan rendition of the myth, Tinia, despite his immortal standing, is physically affected by the childbirth experience. Moreover, his discomfort is relieved and the birth facilitated by midwives. Responding favorably to their aid, Tinia comfortably reclines. 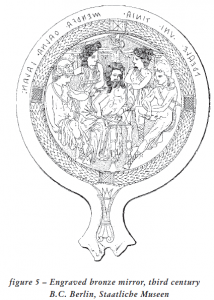 Tinia’s willingness to receive female assistance, a testament to his need, is further supported by his portrayal on an early fourth century mirror recovered from Palestrina (Fig. 3). Here he welcomes the kindly overtures of two assistants who work to assuage his discomfort, which is particularly evident in the awkward splaying of the fingers of his left hand. In this way, the visual, and hence contextual, supremacy assigned to Zeus is revised: Tinia shares the illustration of the delivery, and any resultant commendation for the birth, with the capable goddesses who attend him. Also seen on the Arezzo mirror is Menrva, who emerges from Tinia’s disheveled hairline dressed in full war regalia: she carries a circular shield with her left hand, a spear with her right, and wears a Corinthian helmet similar to that worn by Athena in Greek versions of the legend. Although she strides assuredly forward, her posture is not particularly aggressive, in striking contrast to her Hellenic counterpart. The more congenial portrayal on this mirror is further evident in the Palestrina scene. Although Menrva takes a slightly more assertive stance in three less detailed works dating to the Hellenistic period, mirrors now located in Paris, Berlin, and London, her already diminutive stature is so drastically reduced in these later examples that any attempt at intimidation on her part is rendered preposterous (Figs. 4, 5, and 6, respectively). Moreover, although she raises her spear, her pose is static, devoid of energy. Positioned before the triangular pediment of a temple façade which stands behind the assembled group of immortals, this Lilliputian, immobile Menrva more closely resembles an akroterion than a newborn goddess, let alone a menacing warrior. The radically truncated size and stiff pose of Menrva as she appears on these third century illustrations, in conjunction with her position against the backdrop of a temple pediment, result in a rather placid representation of the goddess. The deities present in the Berlin and London mirrors, equally statuesque, betray no disquiet in their reactions to Menrva; instead, they gather around, gazing at her with discernable esteem. The female attendants present on the Paris mirror seem likewise undisturbed by Menrva’s empty attempt at intimidation. In fact, two of the three reach fearlessly toward the goddess, anxious to remove her from Tinia’s cranial womb. The interaction between Menrva and one or more of her female deliverers may be a consequence of her less intimidating demeanor, for while the Greek Athena seems to deter observers from attempting physical contact, this milder incarnation of the goddess does little to discourage the aid of those around her. Her aggressive comportment may have seemed appropriate in the Greek sphere, particularly as a reaction to Hephaistos’s brutally well-placed axe blow, but any such threat of assault in the Etruscan context is unwarranted, as her birth is expedited by the gentle assistance of midwives. Thus, while the Etruscans preserve the martial character of the Greek Athena, the belligerent bearing of the newborn is reduced or eliminated altogether. At the far right of the assembled group depicted on the Arezzo mirror stands Sethlans, the Etruscan equivalent to Hephaistos, who casually witnesses the birth from a distance. In his left hand he holds an axe, the tool used, according to Greek lore, to expedite the goddess’ delivery, yet his posture does not betray the characteristic agitation of his Greek counterpart, who consistently turns to move away from Zeus and Athena. Sethlans merely stands by, apparently uninvolved in the delivery. Hephaistos’s active role of facilitating the birth seems to have been lost in the translation of the legend from Greek to Etruscan art, and therefore, Sethlans is most often absent from the scene. The role for which the lame smith god was cast in the Greek tradition is assumed by two or more female figures, thereby rendering Hephaistos’s delivery technique not only superfluous, but undesirable. Etruscan illustrations of the legend portray the birth in a manner more similar to a mortal delivery, in which the parturition of an infant is facilitated by midwives. To the right of Tinia in the scenes depicted on the Berlin and London mirrors, Uni, the Etruscan equivalent to Hera, sits and observes her husband’s delivery of the young warrior. She does not physically interact with either father or daughter, but is content to simply witness the event. Quite unlike those females present at the birth in Greek images, but similar to those around her in these two Etruscan scenes, she appears unperturbed by both her husband’s reproductive capability and the countenance of the newborn Menrva. She leans toward her husband, directing her attention to the exit wound at the crown of Tinia’s head, evidently fascinated by Menrva’s emergence and eager to be associated with the event. The inclusion of a perceptibly supportive, unafraid, and, most notably, well-disposed Uni alongside her husband in Etruscan adaptations of the legend represents a significant departure from the Greek tradition. Her portrayal in the Etruscan scenes surely reflects the importance assigned to married couples in Etruscan art and life. Although it is Tinia who births the goddess, his wife is conspicuously brought to the scene, her comportment revealing an approving, even encouraging attitude. There is no hint of the embittered competition evident in Greek literary sources; rather, she observes Tinia and Menrva with admiration. Perhaps her attendance signifies a reunification of the couple, an introduction of gender balance to the myth, and a visual reestablishment of the family unit. In the absence of a birth mother, Uni assumes an essentially maternal position. In each of the extant Etruscan visual adaptations of the myth, goddesses surround Tinia. These female deities are purposefully included for their ability to contribute to the delivery of the warrior goddess. In several such scenes, these women physically interact with both father and daughter in a manner representative of ancient midwifery. As mentioned above, they may reach for Menrva and/or comfort Tinia with gestures that divert the viewer’s focus from the central pair and cause the viewer to acknowledge their essential role in the birth. Although Tinia and Menrva occupy the most prominent position in every illustration and attract the attention of all those in attendance, they willingly share the limelight – and therefore recognition for this unique accomplishment – with these goddesses. Hence, the predominance assigned to Zeus is tempered by the Etruscan artist. Female figures are introduced to the scene, assuming a crucial role in the birth process. Consequently, the Greek myth, so unnaturally devoid of femaleness, is infused with a surrogate maternal presence. Three distinct female figures,most often identified by inscriptions, appear in Etruscan adaptations of the myth of Athena’s birth: Thanr, Thalna, and Ethausva. On the Arezzo mirror, an elegantly dressed female figure, identified as Thanr, stands to the left of Sethlans, between him and Tinia. She looks to Menrva, who appears to meet her gaze, and reaches to retrieve the newborn from the unconventional womb, her capable hands nearly touching the young goddess in anticipation of her first step forward. Thanr also appears on the Palestrina mirror, where she is depicted with wings, plainly marking her as a superhuman entity. She wears an expression of genuine concern as she observes Tinia and deftly wraps a bandage around the crown of his head, binding the exit wound in an effort to ease his pain and promote healing. While on the Arezzo mirror her primary concern is the well-being of Menrva, in this instance her attention is directed toward the comfort and health of Tinia. In addition to her appearance in these two depictions of the birth of Menrva, Thanr appears on several other mirrors that associate her with romantic and/or conjugal love and children. The first of these reunites Thanr with Thalna, her colleague on the Arezzo mirror. Here, the two women flank Hercle, the Etruscan equivalent to Herakles, who cradles a young boy commonly identified as Epiur, a figure particular to Etruscan mythology but often seen in the company of Hercle. Elsewhere, Thanr witnesses the romantic embrace of Achuvizr and Alpanu, who presents her beloved with an egg, perhaps symbolizing the fecundity of their union. Here, Thanr’s presence may further indicate the fruitful potential of the pairing. In an equally amorous scene, Thanr wraps her arms around Alpnu, boldly meeting his gaze and kissing him fervently on the lips. A woman identified by an inscription as Thalana, a spelling variation on Thalna, a fellow midwife included in depictions of Menrva’s birth, sits to the left of the couple and proffers an egg. The various circumstances in which Thanr appears, including parturition scenes and images representative of romantic unions, suggest that she was a deity specifically associated with fertility and childbirth. Archaeological evidence indicates that Thanr received cult worship in Etruria. She is named in a number of dedicatory inscriptions, a form of homage particularly appropriate to a goddess of love, fertility, and childbirth in Etruria, where an ample number of kourotrophoi recovered from sanctuaries that appear to be the ancient equivalent to fertility clinics attest to the popularity of mother/fertility goddess worship. Her name also appears on the Zagreb Text, a liturgical calendar of sacrifices and prayers, and on the Magliano Plaque, a fifth century B.C. calendar of sacred offerings, two of a very few surviving Etruscan religious texts. Thanr was an entity who was both recognized and revered by the female population in Etruria, the primary owners of these mirrors. Her active role in the birth of Menrva would have been acknowledged, therefore, by the Etruscan viewer. The inclusion of such an important native deity in scenes of Menrva’s propagation, coupled with her interaction with Tinia, causes the viewer to concede her critical role in the birth, and thus affirm the vital role of the female in the generative process. As Thanr attends to the newborn goddess in the scene found on the Arezzo mirror, Thalna, standing to the left of Tinia, concerns herself with the well-being of the delivering father. Emulating midwifery techniques practiced inmortal childbirth, she extends both arms to encircle Tinia’s bare midsection and grasps his abdomen, perhaps massaging his belly in an effort to relieve pain and speed the birth. Her body language clearly indicates her concern for him at what appears to be a difficult moment. In short, Thalna diligently works to comfort the new father, while simultaneously bringing forth the child. Her method, characterized by demonstrative attention to the abdomen, more faithfully serves a woman bearing a child naturally. Still, her literal gesture, an unmistakable technique of midwifery, makes the purpose for her inclusion in the scene clear. She is more than amere witness: she makes a crucial contribution to the occasion, re-introducing woman as fundamental to reproduction. Thalna also appears in the Berlin and London mirrors mentioned above. These more static illustrations of the event place Thalna very close to Tinia, seated just behind and to the left of the god, where she observes Menrva. She and three other deities gather around Tinia in a pose that resembles an obviously staged group portrait. Thalna’s inactivity in these scenes does not invalidate her explicit contribution to the birth as it is depicted on the Arezzo mirror, particularly when considered in conjunction with some of the other scenarios in which she appears. 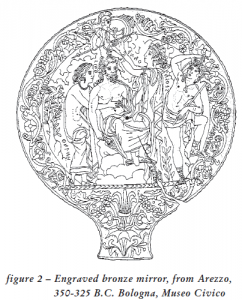 Much like Thanr, Thalna appears frequently on Etruscan mirrors, usually in scenes drawn from the realm of female experience, including romantic love, childbearing, and infants. One mirror, dating to about 400 B.C., similarly casts Thalna in the role of midwife. On this occasion, she delivers Fulfluns, the Etruscan equivalent to Dionysos, from the thigh of Tinia, who is readily identifiable by his bolt and scepter. Here, Thalna gingerly lifts the newborn from his father’s groin, the makeshift womb where he had gestated following his mother’s violent death by Zeus/Tinia’s lightening bolt. Her involvement in the birth of the god is once again dynamic, and therefore crucial. Her interactive role in the Etruscan adaptation of another Greek myth lacking the traditionally essential contribution of the female may similarly infuse this legend with a maternal essence. In still another occasion revolving around a child, Thalna attends Hercle’s formal presentation of the winged Epuir to Tinia. 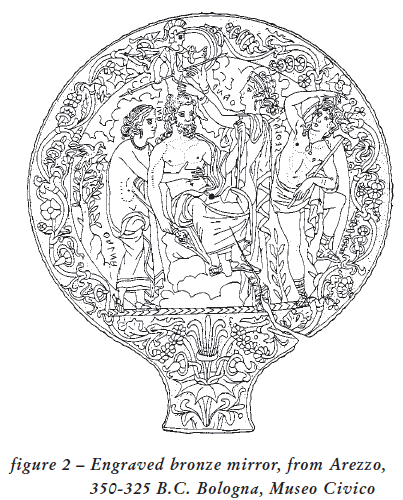 Tinia, Thalna, and Turan, the Etruscan Aphrodite, are all seated on ornamental chairs, surrounding the hero and infant. Epuir casts his gaze upon Tinia, awaiting his reaction, as the enthralled attention of the others is directed toward the child. Dressed in a patterned robe, jewels, and tiara, Thalna, who leans forward in anticipation, closely resembles Turan. Her appearance in this scene, amid such noble company, may suggest that her position within the Etruscan pantheon was substantial. Thalna, like Thanr, also commonly appears in amorous scenes. In one such illustration, the lovers Turan and Atunis – or the mature fertility goddess, Aphrodite, and her young consort, Adonis – embrace passionately before a couch or bed, while Thalna, here a winged deity, approaches from the right to crown Turan with a wreath. As mentioned above, she proffers an egg in a scene picturing Thanr and Alpnu locked in an ardent embrace. In still another instance, Thalna usurps a role more commonly filled by Turan, as she and Anchas, perhaps an Etruscan Anchises, are seated together in a pose ordinarily assumed by Turan and Atunis. Evidently, the station occupied by Thalna in Etruscan mythology was similar to that of her cohort in the delivery of Menrva, Thanr. She appears to have been closely associated with romantic and/or conjugal love, childbirth, and infants. Thalna’s name – which may be derived from a proto-Greek word stem meaning “to sprout” or “to bloom” (an appropriate name for a goddess so closely associated with love affairs and the resultant childbearing) is absent from any dedicatory inscriptions or surviving religious texts, suggesting that she may not have received cult in Etruria. However, the frequency with which she appears on mirrors indicates that she, like Thanr,was a goddess of some standing who would have been particularly well known to women, as she is most often present in scenes taken from the female sphere. The involvement of this goddess in Menrva’s birth is certainly significant. As was the case with Thanr, the inclusion of this deity associated with romantic and/or conjugal love and childbirth in Etruscan adaptations of the legend effectively infuses this myth of self-reliant male parturition with a surrogate maternal quality. To the right of Tinia on the Palestrina mirror stands Ethausva. Bowing her head to regard Tinia and perhaps discern his needs, she tenderly lays her left hand on his shoulder. With her right hand, she reaches to massage his scalp in an effort to relieve his anguish and ease Menrva from his body. Ethausva’s involvement in the delivery is, like Thanr’s and Thalna’s, quite dissimilar to that of the goddesses present in Greek versions of the myth, who most often stand idly by, merely witnessing the event with the appropriate awe and reverence. 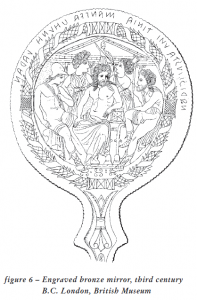 Although this image represents her only appearance on a surviving Etruscan mirror, the inscription of the letters Eth, along with the names of several other known Etruscan deities, on the Piacenza liver, a bronze model of a sheep’s liver used for training in the art of divination, has been postulated to be an abbreviation of her name. Her inclusion on this religious object indicates that she was a goddess of considerable import. Tinia’s reliance upon such a significant figure would not have gone unnoticed by the ancient viewer, who would certainly have been familiarwith this deity. Her very presence, in addition to her intimate involvement with father and daughter, reinforces the crucial role of woman in the birth process. So, although Tinia gives birth to Menrva himself, without the mortal essentiality of a womb, his ability to do so depends upon the help of midwives. Although the event represented on these bronze mirrors is easily recognized as the birth of Athena, or Menrva, Etruscan versions of the scene diverge from the Greek model considerably. The central figures of Tinia and Menrva resemble Zeus and Athena in the Greek literary and visual sources, with both deities carrying attributes that correspond to their Greek counterparts. Likewise, Sethlans is easily recognized by the axe he holds. Yet, despite the clear corporal correspondence of these deities to the Olympians presented in Greek images, the countenances of the Etruscan gods are perceptibly different: Tinia appears tired, even vulnerable, unwilling or unable to evince the remarkable strength of Zeus; Menrva is confident, but hardly threatening; Sethlans casually observes the scene rather than making a swift, possibly timorous departure. Perhaps most significantly, the passive female onlookers of theGreek images are absent. They have been replaced by goddesses who interact with father and daughter, their beneficial advances evidently welcomed by both. They act as midwives, thereby making their presence in Etruscan versions of the legend crucial. By actively contributing to the successful delivery of the warrior, these capable goddesses infuse the myth with a vital female element. This Etruscan modification of the Greek model bespeaks a native appreciation of, and respect for, women as individuals capable of much more than just procreative contributions to society. Ultimately, the Etruscans infuse a virtually misogynistic Greek myth with a previously absent feminine quality. Consequently, their version of the birth, while still the story of delivery by a male, manages to convey the necessity of the female in such an enterprise. Rather than exalting Zeus for surpassing the need for woman, Etruscan visual representations of the birth – through the inclusion of capable goddesses, arguably surrogate maternal entities, who by their salutary abilities realize the birth – effectively reinforce the indispensability of woman, not only at this mythical moment, but also in their society. 1. The original version of this study was submitted as my Master’s Thesis at Southern Methodist University in 1999. I would like to offer my sincere gratitude to Professors P. Gregory Warden, Annemarie Weyl Carr, and Melissa Barden Dowling for their encouragement and thoughtful contributions to that paper. I would also like to thank Professor Susan Downey of the University of California, Los Angeles, for her insightful suggestions for this revision. 3. Hesiod, Theogony 886-900 and 924-929, trans. M.L. West, in Theogony / Works and Days (New York: Oxford University Press, 1989). 4. Apollodoros, Library 1.3.6, trans. Michael Simpson (Amherst: University of Massachusetts Press, 1976). 5. Aeschylus, The Eumenides 736-738, trans. Richmond Lattimore, in Aeschylus I / Oresteia (Chicago: The University of Chicago Press, 1953). 6. Homeric Hymn 28 to Athena, trans. Apostolos N. Athanassakis, in The Homeric Hymns (Baltimore: The Johns Hopkins University Press, 1976); Pindar Olympian 7, 32-38, trans. Frank J. Nisetich, in Victory Songs (Baltimore: The Johns Hopkins University Press, 1990); Euripides Ion, 452-455, trans. Ronald Frederick Willets, in Euripides III (Chicago: The University of Chicago Press, 1958). 7. Homeric Hymn 28 to Athena 6-12; Pindar Olympian 7, 32-38. 8. The moments immediately following her emergence are occasionally depicted, and in such instances, Athena may stand on Zeus’s lap. 9. The conspicuous passivity of Hera, Demeter, and Eileithyiae, all goddesses associated with motherhood and/or childbirth and hence suitable contributors to the process of Athena’s birth, accentuates the profundity of Zeus’s achievement. 10. For discussion and illustrations, see Demand, 1994. 11. Zeus’ extraordinary vigor is indicated by his dynamic gesticulation on a black figure cup by Phrynos, circa 560 B.C. Beazley 1956, 168. Aparticularly authoritative motion made by Zeus on a fifth century red figure pelike by the Painter of the Birth of Athena actually conveys his dismissal of the assembled deities, their presence and/or assistance no longer desired. Beazley 1963, 494, 1. 12. Her aggression is particularly evident on the Phrynos cup, but is also manifest on a sixth century B.C. 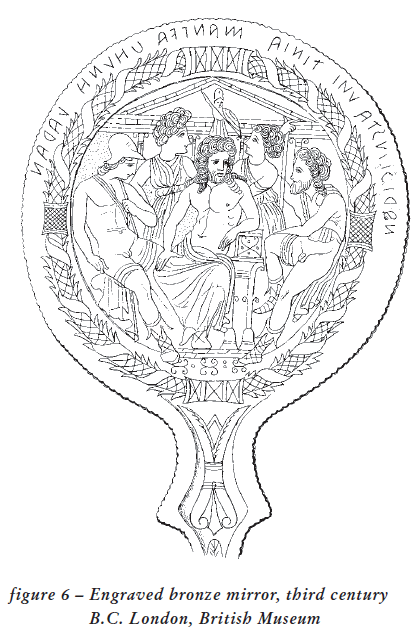 Olympian shield band panel. Carpenter 1991, fig. 98. 13. As is expressed in Pindar’s account that heaven and earth trembled before her. Pindar, Olympian 7, 32-38. 14. Hesiod, Theogony, 927-929; Homeric Hymn 3 to Apollon, 305-317 and 322-331. An Attic red figure hydria by the Painter of Tarquinia 707, circa 470-460 B.C. shows Athena’s spear pointed at the throat of a female figure who has been identified as Hera by Arafat 1990, 37. If the identification is correct, perhaps this physical threat is a subtle reference to the initial animosity between Athena and her step-mother. Beazley 1963, 1112, 3. 15. These goddesses have no recognizable attributes and are generally identified based on the context of their appearance (a birth scene). In a few instances, however, they are identified by inscriptions. on the status of women in Athenian society: “Hetaerae we keep for pleasure, concubines for daily attendance upon our person, but wives for the procreation of legitimate children and to be faithful guardians of our households.” Demosthenes, Against Neaera, 59.122, trans K. Freeman in Lefkowitz and Fant, 1992, 82. 18. The original version of this study, written in 1999, incorporated an iconographic analysis of the birth of Athena as it appears on an impasto krater from Caere, once dated to the late seventh or early sixth century B.C., now in the collection of the Louvre (D151); however, research published in 2000 determined the vessel to be a pastiche. SeeGeppert 2000, 33-38. 19. This dismissal of the newborn Greek Athena’s savage potential does not extend to artistic portrayals of the adult goddess, for images of Menrva fulfilling her role as a warrior are not uncommon in Etruscan art. A fourth century engraved bronze mirror from Perugia, for instance, shows Menrva engaged in what must be an episode from the Gigantomachia: here, she attacks the giant, Akrathe, brutally threatening her opponent with his own severed arm. Eduard Gerhard, ed. Etruskische Spiegel: I, 68; Frascarelli, ed. Corpus Speculorum Etruscorum Italia 2: Perugia – Museo Archeologico Nazionale, (Rome: “L’Erma” di Bretschneider, 1995): I, 25-26 and 62-65. Clearly then, Menrva’s approachability as a newborn does not indicate a permanent degradation of her martial character. 21. De Grummond 1982, 125. 22. Eduard Gerhard, ed. Etrusckische Spiegel: IV, Pl. 324 and p. 61-63. 23. Ibid., Pl. 326.A and p. 61-63. 24. Bonfante 1986, 252 ff. 26. Larissa Bonfante calls this inert formation of assembled deities a “conversation group.” Ibid., 36. 27. Eduard Gerhard, ed. Etruskische Spiegel: I, Pc. 82. 28. Ibid., II, pl. 181. 29. Ibid., V, pl. 25 and p. 30-31. 30. Ibid., IV, pl. 326 and p. 64-65. 31. De Grummond 1982, 124. Arafat, K. W. 1990. Classical Zeus: A Study in Art and Literature. Oxford. Barker, G., and T. Rasmussen. 1998. The Etruscans. Malden, MA. Beazley, J. D. 1949. 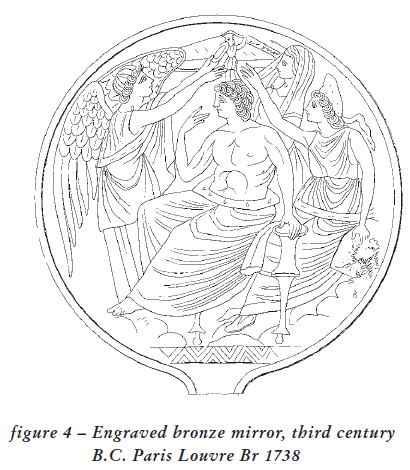 “The World of the Etruscan Mirror.” JHS 49: 1-17. Beazley, J. D. 1956. Attic Black-figure Vase-painters. Oxford. Beazley, J. D. 1963. Attic Red-figure Vase-painters. 2d ed. Oxford. Beazley, J. D. 1986. The Development of Attic Black-Figure. Los Angeles. Blundell, S. 1995. Women in Ancient Greece. Cambridge. Boardman, J. 1994. The Diffusion of Classical Art in Antiquity. Princeton. Bonfante, L. 1981. “Etruscan Couples and Their Aristocratic Society.” In Reflections of Women in Antiquity. Edited by H. P. Foley, 323-343. New York. Bonfante, L. 1984. “Dedicated Mothers.” Visible Religion 3: 1-9. Bonfante, L. 1986. Etruscan Life and Afterlife. Detroit. Brendel, O. J. 1978. Etruscan Art. New Haven. Camporeale, G. 1960. “Thalna e scene mitologiche connesse.” StEtri 28: 233-262. Camporeale, G. 1966. “Thalma.” Enciclopedia dell’Arte Antica: Classica e Orientale. Carpenter, T.H. 1991. Art and Myth in Ancient Greece. London. Cassimatis, H. 1984. “La naissance d’Athena.” LIMC. Zurich. Conti, G. 1976. “La Patera Cospiana.” Archeologia Classica 28: 49-68. De Franciscis, A. 1958. “Atena.” Enciclopedia dell’Arte Antica: Classica e Orientale. Rome: Instituto Poligrafico dello Stato. De Grummond, N. 1982. 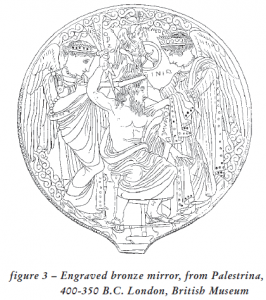 A Guide to Etruscan Mirrors. Tallahasse. De la Geniere, J. 1988. BCH 112: 83-90. Demand, N. 1994. Birth, Death, and Motherhood in Classical Greece. Baltimore. Frascarelli, ed. 1995. CSE Italia 2: Perugia – Museo Archeologico Nazionale, I. Rome. Gantz, T.N. 1971. “Divine Triads on an Archaic Etruscan Frieze Plaque from Poggio Civitate (Murlo).” StEtr 39: 2-24. Geppert, K. 2000. “Vrais Vases, Faux Décor: Nouvelles Considérations sur le Décor de Deux Vases Étrusques du Louvre.” Revue du Louvre: 33-38. Gerhard, E., ed. 1843-1897. Etruskische Spiegel I-V. Berlin: G. Reimer. Hampe, R. and E. Simon. 1964. Griechische Sagen in der fruhen etruskischen Kunst. Mainz. Herbig, R. 1955-1956. “Die Kranzspiegelgruppe.” StEtr 24: 183-205. Just, R. 1989. Women in Athenian Law and Life. New York. Kajanto, I. 1972. “Women’s Praenomina Reconsidered.” Arctos 7: 13-30. Kauer, S. 1959. Die Geburt der Athena. Wurzburg. Keuls, E. C. 1993. The Reign of the Phallus: Sexual Politics in Ancient Athens. 2d ed. Los Angeles. Krauskopf, I. 1974. Der thebanische Sagenkreis und andere griechische Sagen in der etruskischen Kunst. Mainz. Kunze, E. 1950. Archaische Schildbander. Berlin. Laager, J. 1957. Geburt und Kindheit des Gottes. Winterthur. Lambrechts, R., ed. 1995. CSE: Stato della Citta del Vaticano, I. Rome. Lefkowitz, M. R., and M. B. Fant. 1992. Women’s Life in Greece & Rome: A Source Book in Translation. 2d ed. Baltimore. Lissarrague, F. 1992. “Figures of Women.” Translated by A. Goldhammer. In A History of Women from Ancient Goddesses to Christian Saints. Edited by P. S. Pantel, 139-229. Cambridge. Mansuelli, G.A. 1948-1949. “Studi sugli specchi Etruschi.” StEtr 20: 59-98. Nielsen, M. 1989. “Women and Family in a Changing Society: A Quantitative Approach to Late Etruscan Burials.” Analecta Romana 17-18: 53-98. Pairault Massa, F.-H. 1992. Iconologia e politica nell’Italia antica. Milan. Pfiffig, A.J. 1975. Religio Etrusca. Graz. Pingiatoglou, S. 1981. Eileithyia. Wurzburg. Rasmussen, T. and N. Spivey, eds. 1991. Looking at Greek Vases. Cambridge. Robertson, M. 1992. The Art of Vase-Painting in Classical Athens. Cambridge. Salskov Roberts, H., ed. 1981. CSE Denmark 1: Copenhagen the Danish National Museum, The Ny Carlsberg Glyptothek. Copenhagen. Sassatelli, G. CSE Italia 1: Bologna –Museo Civico, I. Rome. Van Der Meer, L.B. 1995. 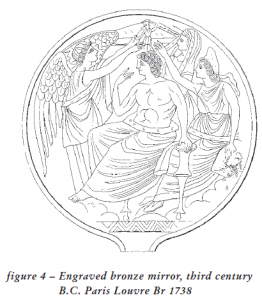 Interpretatio Etrusca: Greek Myths on Etruscan Mirrors. Amsterdam. Zimmer, G., ed. 1995. CSE Deutschland 4: Staatliche Museen zu Berlin Antikensammlung 2. Munich.